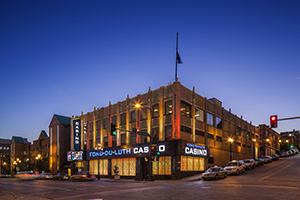 WESTFORD, MA — July 28, 2016 – Tyco Security Products has announced that Fond-du-Luth Casino in Duluth, Minn., has selected its victor video management system as the core platform for its new fully-IP-based video surveillance system, which includes hundreds of new Illustra IP cameras and several new VideoEdge network video recorders (NVRs). With victor at the center of its new system, the casino is able to streamline its surveillance operations, drastically improve video image quality and monitor live and recorded video faster. With the help of its systems integration firm, Brick, N.J.-based North American Video, Fond-du-Luth Casino chose American Dynamics’ victor as its new IP-based video management system because of its intuitive and powerful user interface that allows the casino to view and manage all of its video through a single user GUI interface or a Matrix switcher keyboard. Fond-du-Luth’s surveillance operators can quickly identify security issues using victor’s Command Center feature with its Virtual Matrix, which lets operators view live and recorded video, select cameras and communicate quickly between security operator workstations. Fond-du-Luth’s surveillance operators use American Dynamics’ 2089 matrix keyboards to search video history in a matter of seconds and search across multiple recorders simultaneously when performing investigations. Illustra Pro IP PTZ cameras give the casino the high-resolution video quality necessary for monitoring live and recorded activity. The cameras’ fast positioning speed, up to 512° per second, allows surveillance officers to quickly identify suspicious activity at distances of up to 1,000 feet from an individual camera. The Fond-du-Luth Casino is owned and operated by the Fond du Lac Band of Lake Superior Chippewa of Minnesota. The Band is currently working with systems integrator NAV to add additional cameras to the casino and plans to expand the casino’s footprint and to integrate its access control system with victor in the near future.